The next time you bring a gift to a wedding, you should think of Walter Bogdon. The late chocolatier first invented the reception stick — a crunchy, chocolate-enrobed hard candy — for a local couple about to get married more than 70 years ago. A Flatland reader asked what happened to the Bogdon Candy Company. So we unwrapped an answer. Walter Bogdon’s family emigrated from Poland to Hutchinson, Kansas, at the turn of the 20th century. His father worked in the central Kansas salt mines. After high school, Bogdon moved to Kansas City, Missouri, where he found a job at the Loose Wiles Biscuit Company (which became the Sunshine Biscuit Co., a brand owned today by Keebler that you’ve likely seen on a Cheez-It box). Bogdon found success in the company’s confections department and fell in love with sweets. He bought a candy shop in Joplin and began making small-batch treats. In 1945, he came back to the Kansas City area, opening his own candy store in Fairway, Kansas. The shop specialized in custom pieces often decorated by Bogdon’s wife, Ruth. And it was a specialty order for a wedding during that first year of business that launched Bogdon’s most famous product. 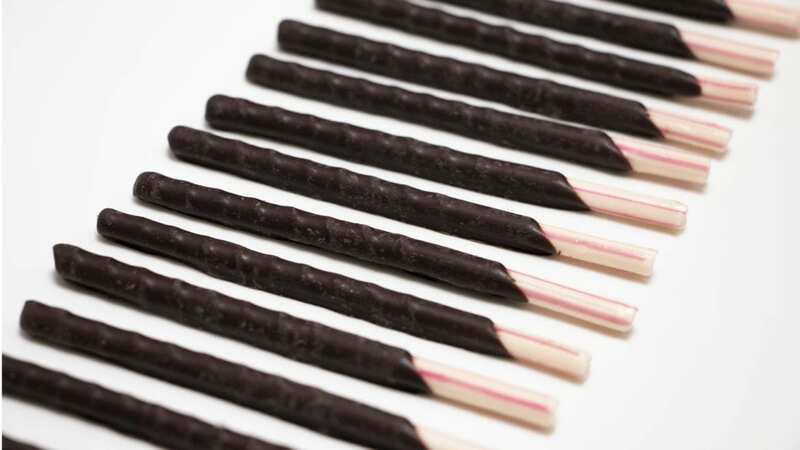 Reception Sticks were thin, long pieces of hand-rolled candy dipped one-at-a-time in melted, bittersweet chocolate. The wedding led to a trial at the long-gone Putsch’s Cafeteria, where Bogdon envisioned them as an after-meal treat like the mints on the counter at a diner. The candy factory was located at 2316 Troost Ave. Today, that’s the site of New Horizons, LLC., an environmental remediation company. In the late 1980’s, Bogdon added Mint Double Dips, a hard-sugar candy stick that got two coatings of dark chocolate before being wrapped in foil. In time, there would be tropical treats (daiquiri, margarita and pina colada flavors), devil dips (hard candy in white and dark chocolate), and fruity double dips (strawberry and citrus sticks dipped in white chocolate). Three generations of the Bogdon family would work for the company. And reception sticks would be given out at high-end department stores like Saks Fifth Avenue and Bloomingdale’s. Back in 1997, The Kansas City Star reported that the factory was making 600,000 sticks per day. In 2007, Salt Lake City-based Dynamic Confections, Inc., bought a controlling interest in the Bogdon Candy Company, Inc. from the Bogdon family. Two years later, the brand and business were sold to Richardson Foods, Inc., based out of Canajoharie, New York. Today, reception sticks are made in New York alongside mints, rock candy, and Beechies gum at Richardson’s manufacturing plant there. Bogdon’s reception sticks are available online (they have been since 1999). World Market in Kansas City, Missouri, has Peppermint Poles.